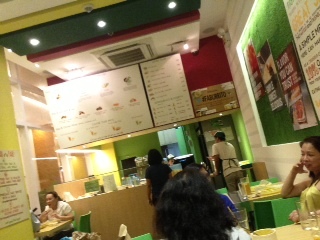 Every Tuesday night, my prayer group would choose a restaurant around the Eastwood/Ortigas area to eat in. 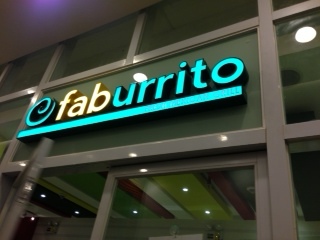 Last week, we chose this Mexican place called Faburrito, located at the Robinson’s Supermarket area in Eastwood. Ever the entrepreneur, the first thing I thought was, “bad location, little traffic.” This particular branch (I understand there’s another one at the Columns, Makati), was at the edge of a corridor, with very little natural traffic. Peterit’ssogoodanddifferenthere, theiringredientsareallnatural, theiceteaislightrefillableandyoucanchangeflavors! I atesomuchbutIdon’tfeelbloatednomsgnogrease! theownerisachristianwhogives10%ofallproceedstocharityandplayschristianmusicallday! youcanhavesomeofthesedeliciouschipstostartyouoff! I was intrigued. Howard was quite excited. Famished, I got a large steak burrito with mango salsa and a lemongrass-flavored iced tea. Apart from Howard’s rave reviews, sipping the iced tea was the first inkling I had that this was going to be a different experience. Then, my burrito came. It was good! 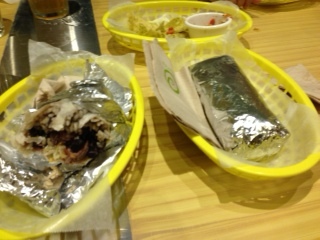 It wasn’t as – powerful (or greasy) – as some of the other burritos in other places, but it was good stuff. Then, I noticed something. I noticed the my “large” order wasn’t that much bigger than my friends’ “regular” order. So I mention it nonchalantly to the nearby waiter. The waiter said something like mine had much more meat inside and stuff. Then after a few minutes, the restaurant gave me a genuine pleasant surprise. They gave me another burrito. I was thanking the waiter profusely and said they didn’t have to do that, that I wasn’t really complaining earlier on. Now THAT was dang good service. It was obvious that the crew was empowered to do what they did. And you know what, that was the type of thing where I TELL ALL MY FRIENDS about it. And you know how word-of-mouth is so powerful for restaurants. Not only that, but Howard was right – even if I ate SO MUCH that night, I somehow still felt light after eating. (not like, say, how I felt last Saturday night after my family’s dimsum-fest) That’s not a small thing. I love what the owner (Earl Chua, according to a quick Google search) is trying to do here. He’s not trying to please everyone. He’s pieced together a grand vision and he isn’t afraid to let the world know about it. THAT’S how to go after a niche. I love it. He just plunges in, implements his vision vigorously, and puts it on a sign for everyone to see. 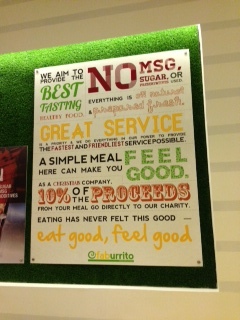 You FEEL the difference when you visit Faburrito. The iced tea differs. The service differs. The blaring Christian music differs. The lack of grease differs. If you ARE a part of the targeted audience, then the reaction will be like Howard. You will feel “it gets you” and you tell all your friends (excitedly) about it. If you AREN’T part of the targeted market? I have a feeling you STILL will feel the differentiation and remember it enough to tell your friends whom you think belong to the audience targeted. Prayer group? You’ll love the music while sharing! my family is always at eastwood during sundays and i can’t wait to try this place. thanks for sharing!